"Six North Island brown kiwi have been released on the slopes of Mt Bruce, or Pukaha, after a 100-year absence from Wairarapa"
"Trap-shy stoats are a problem for pest controllers battling to protect kiwi, a Department of Conservation report has found"
"A rare Haast tokoeka kiwi chick has been hatched outside the wild for the first time at Queenstown"
Seven rowi kiwi chicks were moved in January from the Okarito sanctuary to predator-free Motuora Island in the Marlborough Sounds, and four tokoeka chicks from Haast were taken to the Burwood Reserve at Te Anau. Department of Conservation rescues were necessary because of another masting season that caused a proliferation of rats and a consequent stoat plague. Despite extensive trapping that removed twice the number of stoats than the previous season, the pest could not be controlled. The difficulties at Okarito and Haast sanctuaries during the last two breeding seasons, in the face of large trapping numbers, vividly show the extent of the problem of stoat caused kiwi chick fatalities. The New Zealand Biodiversity Strategy Third Annual Report 2002/03 provides good and bad news of intensive kiwi management at three North Island and two South Island sanctuaries. The Whangarei (Northland), Moehau (Coromandel) and Tongararo Forest sanctuaries in the North progressed well, exceeding target chick survival levels. Stoat trapping has been effective in enhancing recovery in these sanctuaries. The managing agency, the Department of Conservation, reports that "...Whangarei saw a robust breeding season and 24 chicks were hatched and monitored. At Moehau, 14 of 18 chicks survived and none were killed by stoats - well above performance targets. At Tongararo Forest 19 chicks were raised using Operation Nest Egg (where eggs are removed and the chicks hatched and reared in a safe environment before being released back into the forest)..."
According to DoC, "... at Okarito just two chicks survived (after removal from the sanctuary) owing to a plague of stoats which killed the other monitored chicks. Despite very high catch rates of stoats, predation levels could not be reduced ..."
The Okarito kiwi, now called rowi, was scientifically described in 2003 as a distinct species Apteryx rowi. It is the most critically endangered kiwi, with a population of less than 200 birds restricted to 12,000 hectares in the Okarito Forest in Westland National Park. According to DoC, adult survival is exceptionally high, with life expectancy at Okarito of more than 56 years. "At the Haast tokeaka sanctuary only two chicks were produced due to poor laying and hatch rates (both survived). The use of Operation Nest Egg is being investigated to increase chicks numbers more quickly"
A plague of stoats at Okarito during the 2002/03 season was brought about by a plentiful food supply from the fruiting of rimu and kahikatea. The fruiting process known as "masting" provides a proliferation of seeds every five years. It is a plentiful food source that causes an increase in rats, which are eaten by stoats. The DoC project manager of the Okarito sanctuary, Jo Crofton, said "by Christmas day we had only two radio-tagged chicks left. I went out on Boxing Day to check on one of them, and its signal was coming from under the ground. Stoats drag their prey and cache them underground". All 14 monitored chicks has been killed by early January. The Kiwi Sanctuary Programme aims to increase the survival of young kiwi in the five sanctuaries so that declining populations begin to recover. DoC is developing population models that assess the effectiveness of long term kiwi management, and assess the impacts of "kiwi-centric" management on other ecosystem values; and is developing a management prescription for application beyond sanctuaries. Write to Prime Minister Helen Clark, to urge more government spending on the conservation of New Zealand's native flora and fauna, and in particular increased funding for pest control. Express your appreciation of the government's reporting of biodiversity strategy successes and disappointments, and stress the need for regular information releases. DoC reports that current trapping for stoats at Okarito and Haast sanctuaries may not be sufficient to increase those kiwi populations. There is a need to immediately advance the development of stoat control to increase the effectiveness of all trapping, and make funds available to protect Southern tokoeka and great spotted kiwi. There are no managed sanctuaries for Southern tokoeka which is in the Fiordland region and Stewart Island, or great spotted kiwi which is in the north western region of the South Island. Little spotted kiwi is the only on pest-free islands, where it is doing well. Stoat predation of juvenile kiwi is known to be the primary cause of kiwi population decline, however, methods for controlling the pest over large areas are not well developed. DoC says that secondary poisoning shows some promise, but research and testing is required. 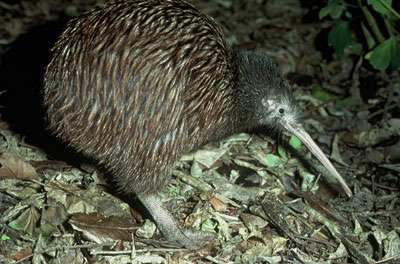 Approximately half of all kiwi eggs fail to hatch, partly because of natural bacteria, and because the parent bird is disturbed by predators. After hatching, chicks are at extreme risk from stoats and cats. About 70 percent are killed by stoats and sometimes cats before reaching six months of age. Another 20 percent die of natural causes or from other predators. When young kiwi reach 1,000 grams at six months old, they are strong and fiesty enough to fend off stoats and cats, but less than 5 percent survive to adulthood. Stoats are a very effective predator, able to kill kiwi chicks that weigh four or five times their weight. Stoats are very mobile and wily, and are notoriously difficult to trap. They breed profusely, producing several litters of five or more in one year. Stoats kill as many as 40 North Island brown kiwi chicks a day which adds up to 15,000 each year.